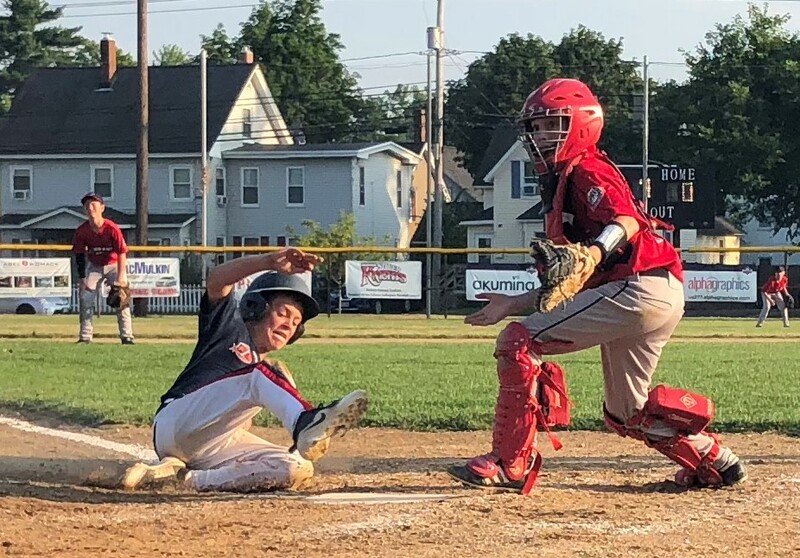 Photo courtesy of Matt Demers/Nashua Cal Ripkne Connor Trip scores the winning run for Freetown-Lakeville, much to the dismay of Apponaug catcher Austin Simas, in a 1-0 win over Apponaug, R.I. in Monday's Cal Ripken 12U New England Regional tournament on Monday. Freetown-Lakeville advances, while Apponaug was eliminated. NASHUA – The Nashua Cal Ripken 12U All-Stars are one win away from playing in the finals of the New England Regionals at Murray Field. Nashua is 2-0 in the event and will take on Hudson, Mass.today at 6:30 p.m. at Murray Field. The winner of that game goes straight to Thursday’s finals at 5 p.m. at Murray. The loser must win an elimination game (losers bracket final) Wednesday at 6 p.m. at Murray to get to Thursday’s finals, then win twice. The game was scoreless until the bottom of the seventh when Trevor Sargent lifted a sacrifice fly to left field scoring Connor Trip on a close play at the plate. Dylan Roberts pitched six strong innings for Apponaug, but it wasn’t enough as the Rhode Island team was eliminated. Dover broke open a tight game in the fourth, scoring six runs. Tim McGregor, Judah Payeur, and Bryce Carberry had multiple hits for Dover. Charlie Covert had three runs scored. Sam Bisesi and Ted Cooney each had an RBI for New Canaan, which is now eliminated. Freetown-Lakeville vs. Dover, 4 p.m.
Nashua vs. Hudson (Mass. ), 6:30 p.m.